My last actual holiday (outside of work) was back in New Zealand (here). All too often I find myself dreaming of the mountains and craving that standing on the edge of the world feeling, most likely with tear-stained cheeks. It is hard to disconnect from work and take a “holiday,” hard to consciously make a decision to put my camera down and separate the two, to allow myself to just be. I’ve spent countless hours, over the years, photographing this sublime world. Often choosing adventure filled destinations where I simply couldn’t just leave my camera behind. And so, the cycle continues. First stop was Buenos Aires (BA), the gateway to South America. Lauren and I left the Gold Coast, boarded via Brisbane, onwards to Auckland and made the final route to BA with Air New Zealand’s business class. I love Air New Zealand as an airline and experiencing business class felt like a real treat and the beginning of a real holiday. For all the travelling I do with my job, I never fly business and it was nice to arrive in a country and feel rested, at least until the onset of jet-lagged knocked us all around. I’ve been to Buenos Aires before on my way to Columbia, but it was a stopover and not somewhere I had a chance to explore. I’ve written so many times how I am not a city girl, but honestly BA surprised me. First of all, the food, oh my god the food – SO many vegan options. I had this built up stereotype of plates of steak and wondered how I’d survive in a carnivore claimed city. Boy was I wrong. We ate at the same café in Palermo for lunch and dinner in one day because it was that good. Travelling with two other veggie-heads definitely makes things easier. We spent a few days wandering the city, the little districts (Palermo, Recoleta, Puerto Madero, Belgrano, San Telmo, La Boca, Monserrat and Caballito) with our guide and host, Candi. We enjoyed the culture of el fresco dining and street art and I personally loved the cemetery as it reminded me of being in Père Lachaise Cemetery, Paris with my best friend back in 2016; I find there is so much beauty in cemeteries. The parks of Buenos Aires are so green and vibrant bustling with rollerbladers, runners, walkers, and bicycles, all water-sports activities and people soaking up the warm autumn sun. The flower gardens lined with every colour rose you can imagine - the smell divine! At night Buenos Aires comes alive. We enjoyed watching the free outdoor tango on Sunday. I didn’t participate - simply stared - mesmerized by the breathless passion exuding from the strangers in front of me. I love this about travel, immersing yourself completely into a different way of life. A different way of eating, the difference in schedules, the different modes of transport or walking most places, following wherever your feet lead and seeing where you end up. I was completely captivated with the night tango and wanted to learn more, to see more. Sometimes I think I’m not a city girl, and then I find myself in places like BA and realize I actually do enjoy travelling through them. However the adventure was just beginning…. NB *I feel the need to add a side note here with BA to make sure you are aware of your own personal safety. As I was advised by my local BA guide, read up about the fake 500-peso tourist money scam (LINK), don’t walk around with your camera gear around your neck, do not stray from the main streets of places like La Boca, or be alone in the early hours of the morning/ late at night anywhere. We caught our flight from BA to El Calafate. I couldn’t sleep the night before, likely still jet-lagged, but mostly excited. I had my head stuck to the window the entire plane flight (sit on the right hand side going down) as the tears literally rolled down my cheeks at my first glimpse of the Patagonian Andes piercing through the thick layer of clouds. I couldn’t believe my eyes at the turquoise blue of the glacial water. The scale here, from the sky, was expansive. When picking up the car that Will had hired for the next 10 days of adventure I was dancing around in the car park, freezing already but unable to control every particle inside me screaming and moving for joy. 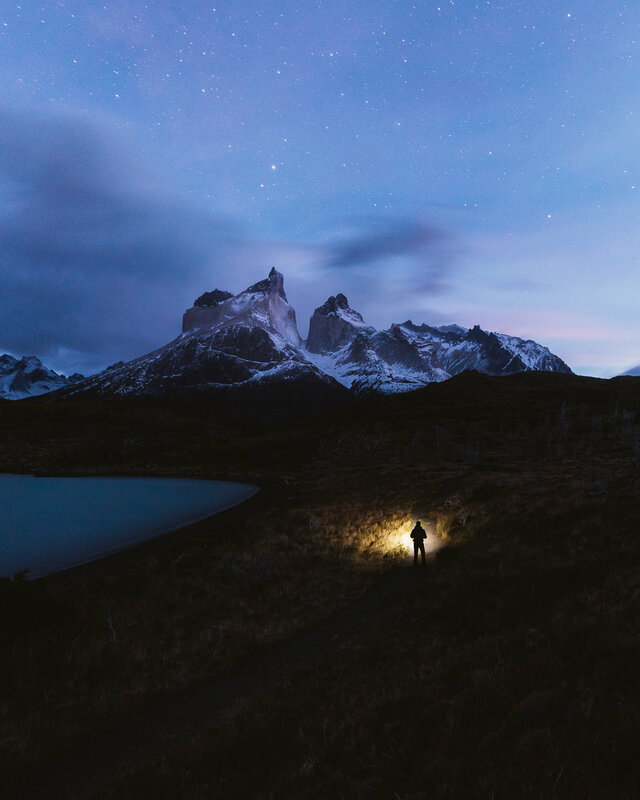 After a night in the cute little town of El Calafate, our epic crew ( Will, Lauren, Davey, Ben, Grace, Nick) set off around 3am bleary-eyed and yet still hopeful Patagonia’s notorious weather would hold out. 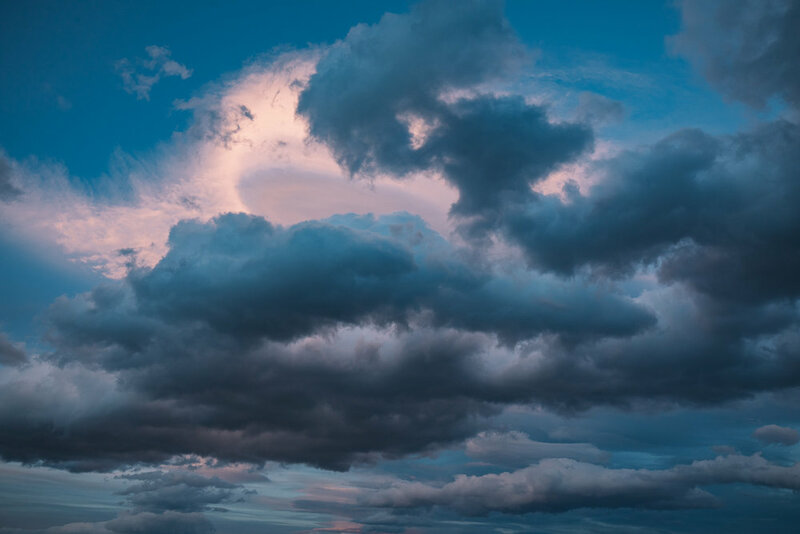 I found myself away from the group, standing alone at the top of the road towards El Chaltén, literally almost getting blown over by the sheer force of the Patagonian wind, left speechless by the explosion of pink in the sky as the sun rose behind me. 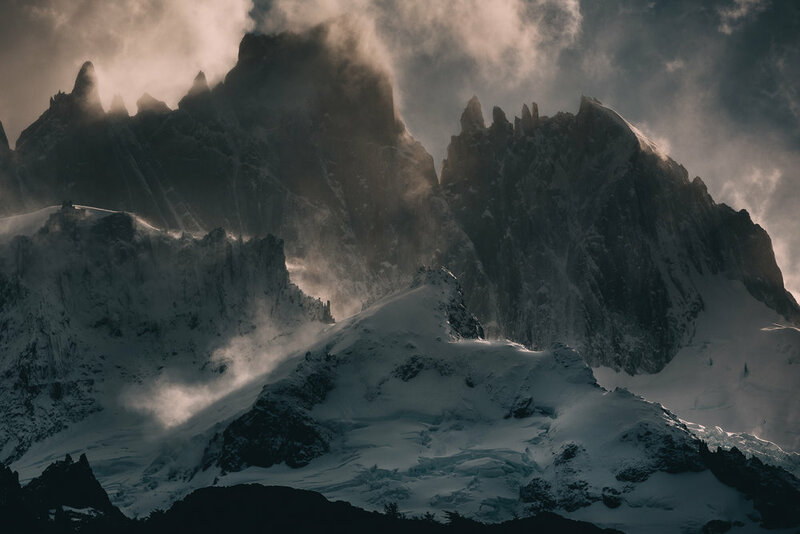 Facing the towering granite peaks of the Patagonian Andes with my heart exploding, I caught my first, very brief glimpse of Mt Fitzroy before the clouds swallowed it up. 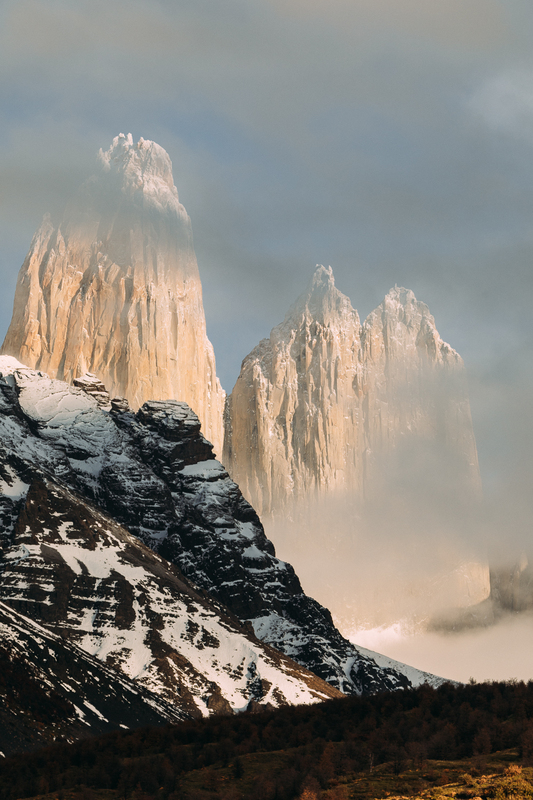 Little did I know that would be the first and only glimpse of the infamous peaks that soar over El Chaltén. The worst window of weather in 7 years. Some of the most beautiful mountains in the world, the most vast, incredible landscapes, those iconic mountains I’d grown up dreaming of, the vibrant turning autumn colours were all just out of reach. The roads were flooded and closed, although we tried a few hikes despite the weather, the chill got into our bones and our clothes soaking wet. 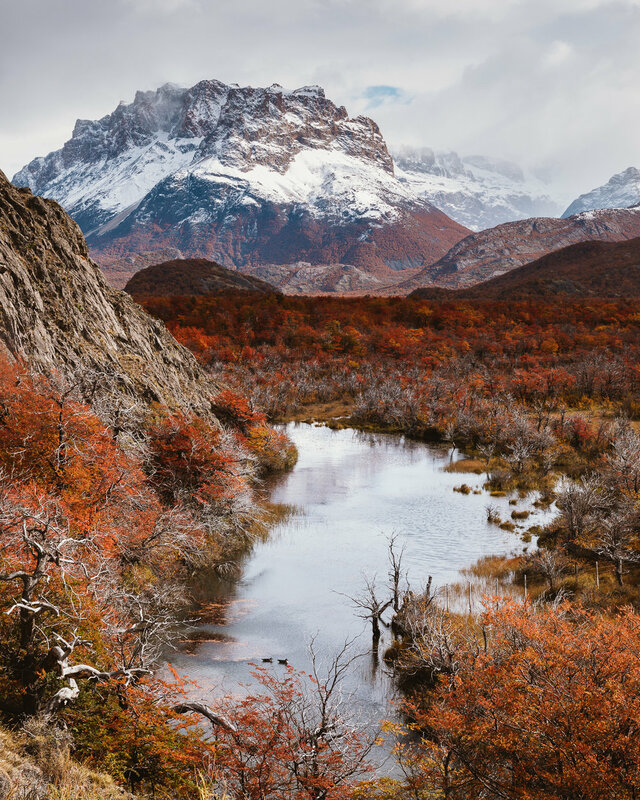 We left the town of El Chaltén without so much as unrolling our sleeping mats, my camping food uneaten, my tent still inside my suitcase - completely dry…. Photographically speaking, I’ve crafted a life by making sure I was in the right place at the right time, and I’d dreamed of visiting this place since I first laid eyes on an image of it. That image was burning in the back of my brain as I stood exactly where it was created and could not see a single thing. There were tears, but of frustration this time. For two weeks leading up to this trip, I was looking at stories being shared of picture perfect weather, so this felt like some sort of cosmic message, a form of universal rejection. It was another lesson on letting go. I firmly believe that expectation is the root of all evil. If you can learn to let go and leave your expectations behind, that is when the real adventure starts. No this wasn’t what I pictured, it wasn’t even close to what I dreamed of, but I was happy. What a privilege it is to have the ability to travel and explore a new country, to open yourself up to new enriching experiences and create lifelong memories with new hearts. Travel is about the experiences, about finding a shift in your perspective and stepping outside of your comfort zone. 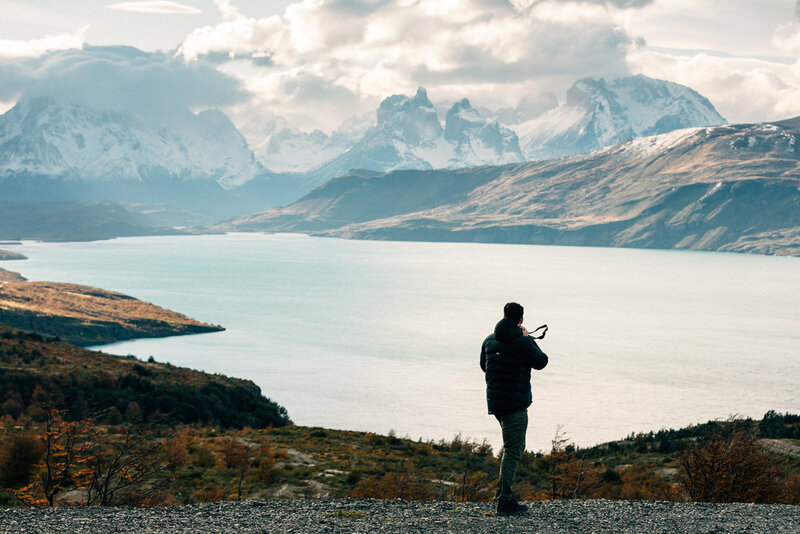 Although what I came to Patagonia for did not eventuate in full, it is not all doom and gloom. The picture I just painted through my disappointment in the circumstances, and the emotional rollercoaster that was brewing in my heart and mind, is not the only story of our trip. I often ponder the detriments of social media’s highlight reel and how I may contribute to only sharing the final or “hero” images, as always I want to be transparent about all emotions - about the life of one that is on the road. That week I met some of my idols. I was in a small town with world class photographers and there were only a few cafes and restaurants open (due to shoulder season) so I ended up at the same places, sharing meals and sitting with the same glass of Malbec. These very photographers paved the way to do what I do and I have spent countless hours pouring over their work, studying and learning from them and now I was there, in real life, having a conversation (about the weather) with them. Wow! We were a determined group and spent our days attempting to trek in the rain. Even in thick overcast weather the autumn leaves still burned so irresistibly vibrant, we saw Canyon Falls rushing and when it began snowing around us it felt like we were in some kind of wonderland. How lucky we were to be there. Just to spend hours waiting in the cold for the smallest window and chance to see an opening in the sky. I’ll never take the sky for granted again, and I didn’t realize I ever had until this experience. And yet, still the story was far from over.. Upon arrival at the breath-taking Perito Moreno Glacier we were greeted by the thundering echo of a chunk of the electric blue glacial tongue breaking off the 70m face, crumbling and plummeting down causing waves bigger than 20m below. Right place, right time? I think we just found it. The tears were frozen to my cheeks. I wore a smile that spanned from one ear to another. We all stood together in disbelief, simultaneously exclaiming a series of “WOAH” whilst holding onto our heads, hearts and each other. The significance of this moment I will remember forever. 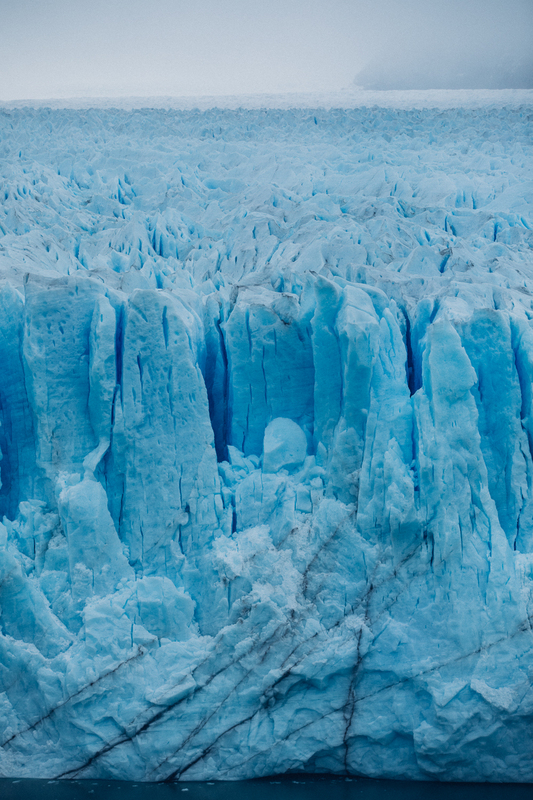 * For those interested in some nature froth: The Perito Moreno Glacier is in a state of equilibrium meaning it’s advancing as fast as it’s declining. This ice field is the third largest reserve of fresh water in the world (only 3 % of all water on our planet is fresh). Glaciers are a climate regulator, which means they keep our beautiful planet cool by reflecting back 45 to 85 percent of the sunlight. From here we leaned forward to the next crazy adventure and began driving the 5/6 hours south towards Chile, where it felt as though our luck had started to change before our very eyes. Crossing through the border security was an event, or interesting spectacle, with seven photographers all carrying a camera bag and suitcase each. However, as we stepped foot into my 30th country I recall feeling an overwhelming sense of immense gratitude. I had unintentionally made it to 30 countries before turning 30. Over the years I have worked really hard, sacrificed a lot and have been incredible lucky at the same time. I wrote an instagram story thanking those of you who follow my journey (and my little feet) around the world. I truly feel so grateful for you. Good road-trips often evoke buried emotions; I was deep in thought contemplating life and why I do what I do despite the loneliness, sleeplessness and stress at times. There is of course the undeniable connection with nature and love of sharing the beauty of the natural world. Deep in thoughts of the full circle of nature to our very existence, wandering down into the life I have created through photography and the interplay with seeking the light - for even on the gloomiest of days there is light. 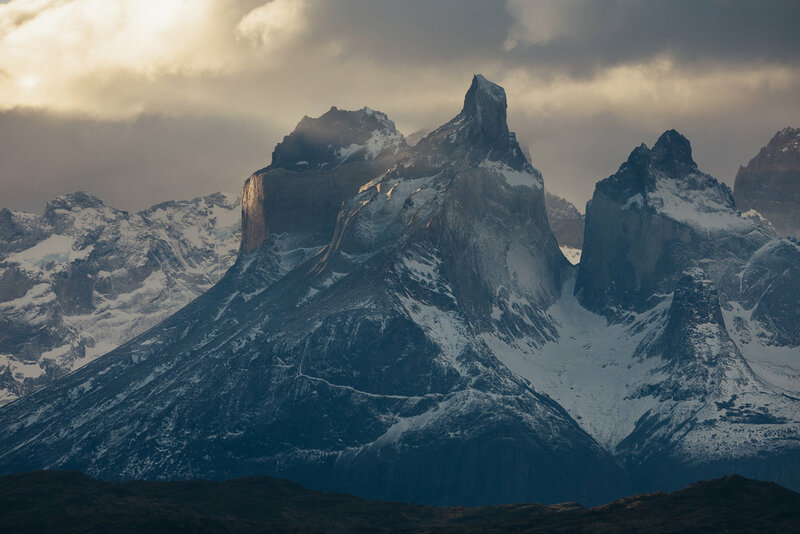 And then, there it was – the light - towering before me in all its ancient wild and rugged glory; the Patagonia Andes of Torres Del Paine National Park. A simple reminder, a gentle nudge from the universe that we travel for more than just photography. It is all about those moments that take your breath away. I am left, again, feeling breathless, humbled. The emptiness was impressive, those jagged peaks and the ruthless terrain, pristine turquoise rivers; I was worlds away from anything I have ever known and I couldn’t have been more captivated. I’ll forever cherish the memories of us here watching the sunset together by the edge of the lake, trekking by star light and opening up to the most unexplainable beauty I have ever seen. Beauty that can only be seen with the eye and felt with the heart. Those days consumed me. 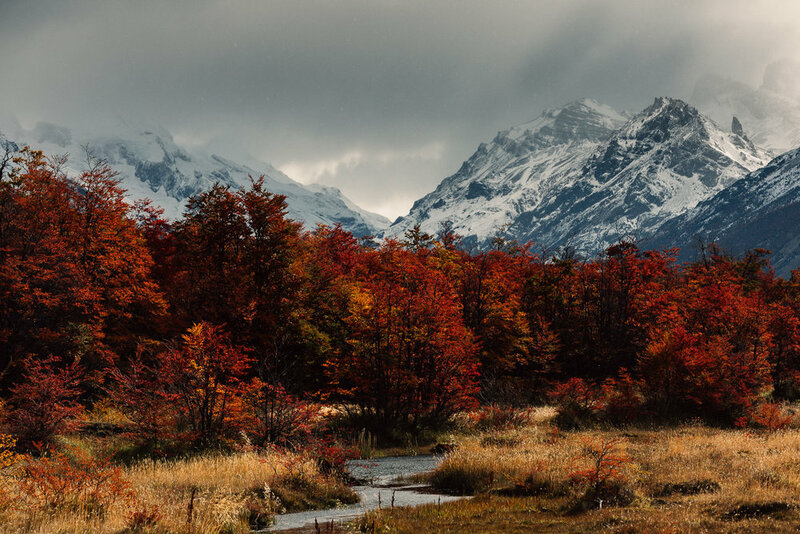 Everywhere I looked was something larger than life, be it in the smile of a stranger along the path, the waterfalls, the autumn flora, the cheekiness of the infamous locals Guanaco (Chilean Alpacas) or just me feeling so small beneath the most dramatic scenes on the planet. The Three Towers hike will remain a mental and physical challenge that I proudly accomplished. Due to the weather, this trail only opened for one day in the 3 weeks prior, so we slept under the stars and woke up at 3:30am to take the chance for sunrise. An 18km return hike and 4 hr steep incline was among the most challenging hikes of my life. It was my first snow hike and at times I was falling into waste deep snow, laughing hysterically, cold and soaking wet. But we made it and right on sunrise. Looking back now I’m still speechless, the scale of what I witnessed is indescribable. Those three striking granite Towers above the glacial lake are higher than two of the tallest buildings in the world stacked on top of each other. When I really fall in love with a place, I struggle to look at the photos…for months. I feel like I will never be able do something so beautiful justice. I struggle to write about it, or even to collect my thoughts. How do you capture the way your heart feels like it’s going to burst through your chest? To put emotions into a single image/s? How does one convey the feeling when your eyes become wide, child-like, and fill up with tears that don’t break, as your smile is frozen breathlessly across your face and your legs are quivering, burning so deeply, but every part of your being is SO alive. Travel turns you into a storyteller. It opens your heart and mind in more ways than one. It invites you to seek the beauty, find the light and never let go of hope. To me, it’s a chance to learn about yourself, who you are and what you want from life. It allows you to see how different the world is and to put your life in perspective. 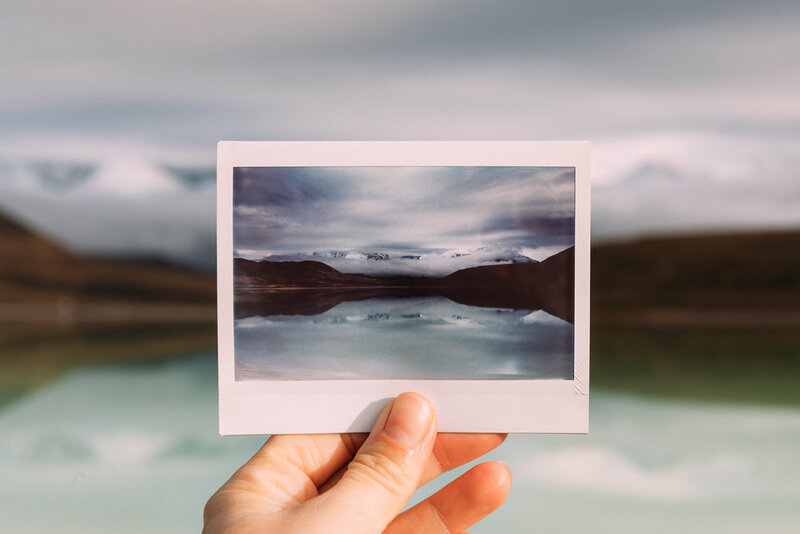 When you remove yourself from your life back home, you’re able to take time to reflect and see things in your life a little differently. Don’t stop dreaming, don’t stop exploring. Don’t stop living. Thank you to my favourites Canon Australia, Air New Zealand and Kathmandu for the trip sponsorship.